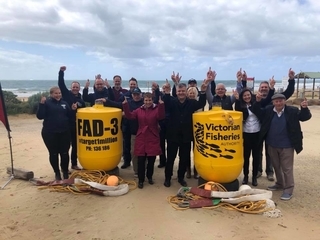 Torquay’s offshore fishing reef will welcome the return of five fish attracting devices (FADs) in November to improve recreational fishing opportunities for saltwater anglers during the warmer months. Minister for Agriculture and Fisheries Jaala Pulford said the five yellow FADs will be attached to the artificial reef by divers with the aim of attracting kingfish – a highly regarded sportfish that is great eating on the dinner table. The two-year trial is funded by the State Government’s Target One Million plan, which is investing a record $46 million to get more people fishing more often. Victoria’s kingfish populations have boomed in recent years and they are now a popular target species for anglers with boats capable of heading offshore. Each FAD consists of a large floating surface buoy attached to a long rope that descends 25 metres to the concrete reef modules below, with flashing lights on the FAD to ensure safe navigation in low light and at night. A smaller sub-surface buoy on the rope adds a secondary fish attracting element to help draw any kingfish around the reef up to the surface. The FADs will be installed for six months, when kingfish are most active, then removed to reduce the risk of damage during large winter swells or entanglement during whale migration. The Torquay reef was deployed in 2015 about three kilometres offshore. It is Victoria’s biggest artificial reef, funded largely by recreational fishing licence fees. The reef consists of 25 concrete modules, up to four metres high and weighing up to 20 tonnes each, arranged into five clusters of five. Each cluster will host one FAD on the surface. For more information visit vfa.vic.gov.au/torquayreef. “Victoria’s offshore game fishing just keeps getting better, with kingfish, southern bluefin tuna, swordfish and sharks providing world-class saltwater sportfishing, which is good for anglers and even for better for local businesses."